The Tourists have lost five of their past six games, dropping their overall record to 9-10. Currently (as of April 24), Asheville holds sixth place in the South Atlantic League’s (SAL) Southern Division, three games behind the Savannah Sand Gnats. As you might expect from a club that isn’t winning many games, pitching has been the primary issue. During this six-game stretch, the Tourists have allowed 32 runs, averaging out to more than five per game. Alex Balog, Konner Wade and Zach Jemiola were roughed up in their latest starts, putting Asheville behind early. Relievers Trent Daniel and Logan Norris also struggled in their recent appearances. 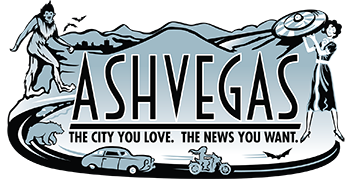 Even for a team with a potent offense like Asheville, giving up runs early creates a difficult obstacle to overcome. That task is even more daunting when the lineup isn’t particularly productive. In those six games, the T’s have scored 12 runs — two per ballgame. No team is going to consistently win with that kind of disparity. Third baseman Ryan McMahon continues to be Asheville’s most reliable source of offense. During the team’s three-game series in Greenville this week, the 19-year-old hit two home runs with five RBI (Runs Batted In). McMahon now has eight homers for the season, easily leading the SAL in that category. (The next closest batter, Charleston’s Michael O’ Neill, has five home runs.) He also ranks first among SAL batters with a .767 slugging percentage and 1.191 OPS (On-Base plus Slugging). Last week, I wrote that McMahon deserves more attention. I don’t think that’s going to be a problem for him from here on out. OK, enough of the week that was. Let’s look ahead to some fun promotions the Tourists have at upcoming home games. Basically, you’ll want to mark off May 1-3 on your calendar with a Thirsty Thursday, Mr. Belding and Spider-Man jerseys all featured during that three-game stretch. Several minor league baseball teams throughout the country are wearing special-themed jerseys this season. For example, the Brooklyn Cyclones just announced they’ll be wearing Darth Maul jerseys for their Star Wars Night on Aug. 2. The Durham Bulls will also be getting into the Star Wars spirit with R2D2 tops on May 4. (May the 4th be with you!) Another team has special jerseys planned for Aug. 2, as the Fresno Grizzlies will sport Teenage Mutant Ninja Turtles jerseys. 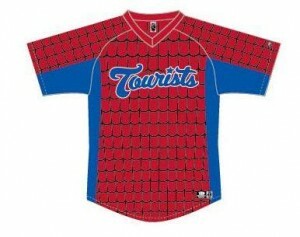 The Asheville Tourists’ special Spider-Man jerseys. So this is definitely a thing going on throughout the minor leagues, and your friendly neighborhood baseball team is joining in the fun as well. Here in Asheville on May 2, coinciding with the release of The Amazing Spider-Man 2, the Tourists will wear Spider-Man themed jerseys (courtesy of Aaron’s Inc.) for their game against the Lakewood BlueClaws. As announced on the team’s Facebook page, the Spider-Tourists tops will be auctioned off with proceeds benefiting the Asheville Tourists Children’s Fund. Those jerseys are pretty sweet. If you told me when I was reading comic books and watching baseball as a kid that those worlds could someday collide for a baseball jersey, my mind would have been blown. 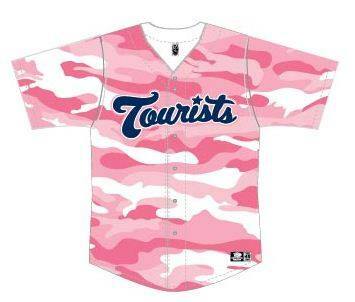 The Asheville Tourists’ special jerseys for breast cancer awareness. The Tourists will wear another set of special jerseys to benefit a good cause on May 16, donning pink camouflaged tops (sponsored by Asheville Radiology) to support breast cancer awareness. The jerseys will be auctioned off during the game versus the Lexington Legends, with proceeds going toward the fight against breast cancer. *** The Asheville Tourists return to McCormick Field on April 29 to begin a seven-game homestand. The team then hits the road for seven games before returning home on May 14 for another seven-game stay. Single game tickets are currently available at the McCormick Field box office. 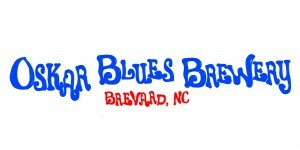 For more information, contact the Tourists’ front office at (828) 258-0428.